Rnd 4: Join Camel with sc in ch-2 sp of first Vst, 7 dc in ch-2 sp of next Vst, (sc in next Vst, 7 dc in next Vst) around, join with sl st in first sc. Fasten off. Rnd 5: Join Rust with sc in first sc, ch 4, skip next 3 dc, (sc, ch 3, sc) in next dc, ch 4, skip next 3 dc, *sc in next sc, ch 4, skip next 3 dc, (sc, ch 3, sc) in next dc, ch 4, skip next 3 dc; repeat from * around, join with sl st in first sc. Fasten off. Rnd 11: Join Coral with sc in ch sp of first Vst, 7 dc in ch-2 sp of next Vst, (sc in next Vst, 7 dc in next Vst) around, join with sl st in first sc. Fasten off. Rnd 12: Join Rust with sc in first sc, ch 4, skip next 3 dc, (sc, ch 3, sc) in next dc, ch 4, skip next 3 dc, *sc in next sc, ch 4, skip next 3 dc, (sc, ch 3, sc) in next dc, ch 4, skip next 3 dc; repeat from * around, join with sl st in first sc. Fasten off. Rnd 17: Join Rust with sc in first ch-3 sp, ch 2, Vst in next ch-3 sp, ch 2, (sc in next ch-3 sp, ch 2, Vst in next ch-3 sp, ch 2) around, join with sl st in first sc. Fasten off. Rnd 18: Join Orange with sl st in ch sp of first Vst, (ch 2, 2 dc cl, ch 2, 3 dc cl) in same sp as joining, ch 3, *(3 dc cl, ch 2, 3 dc cl) in ch sp of next Vst, ch 3; repeat from * around, join with sl st in top of 2-dc cl. Fasten off. Rnd 19: Join Rust with sc in first ch-2 sp, ch 2, Vst in next ch-3 sp, ch 2, (sc in next ch-2 sp, ch 2, Vst in next ch-3 sp, ch 2) around, join with sl st in first sc. Fasten off. Rnd 20: Join Dk Green with sl st in ch sp of first Vst, (ch 2, 2 dc cl, ch 2, 3 dc cl) in same sp as joining, ch 3, *(3 dc cl, ch 2, 3 dc cl) in ch sp of next Vst, ch 3; repeat from * around, join with sl st in top of 2-dc cl. Fasten off. Rnd 21: Join Rust with sc in first ch-2 sp, ch 2, Vst in next ch-3 sp, ch 2, (sc in next ch-2 sp, ch 2, Vst in next ch-3 sp, ch 2) around, join with sl st in first sc. Fasten off. Rnd 22: Join Coral with sl st in ch sp of first Vst, (ch 3, 6 dc) in same sp as joining, ch 1, (7 dc in ch sp of next Vst, ch 1) around, join with sl st in top of ch-3. Fasten off. Rnd 23: Join Rust with sc in first ch-1 sp, ch 3, skip next 3 dc, (sc, ch 3, sc, ch 5, sc, ch 3, sc) in next dc, ch 3, skip next 3 dc, *sc in next ch-1 sp, ch 3, skip next 3 dc, (sc, ch 3, sc, ch 5, sc, ch 3, sc) in next dc, ch 3, skip next 3 dc; repeat from * around, join with sl st in first sc. Fasten off. Special thanks go to Jewel Fernley, Jolene Ortiz, and Rosina Smith for testing this pattern. Wow, beautiful and my colors!!! Beautiful doily...but yours always are! :) Love, love, LOVE the eyelet foundation. I've used it for years, too! Piękna serwetka.Wzór mi się bardzo podoba.Pozdrawiam cieplutko. I love the colors. And the design is stunning! This is beautiful! What brand thread and dk yarn do you use? I don't think I've seen these colors at my local store. The great thing about this doily is you can use up old partially used balls of thread, mixing and matching to make your own creation. How are you intending for us to join each new color? There are so many methods for joining new color. Help! Each Rnd tells exactly what stitch to join with, where to join and even what color to use. You will not be changing colors in the middle of any round, only at the beginning of the rounds. I hope you will enjoy the pattern! Almost finished with my one-color mandala. Love this pattern. Thank you! 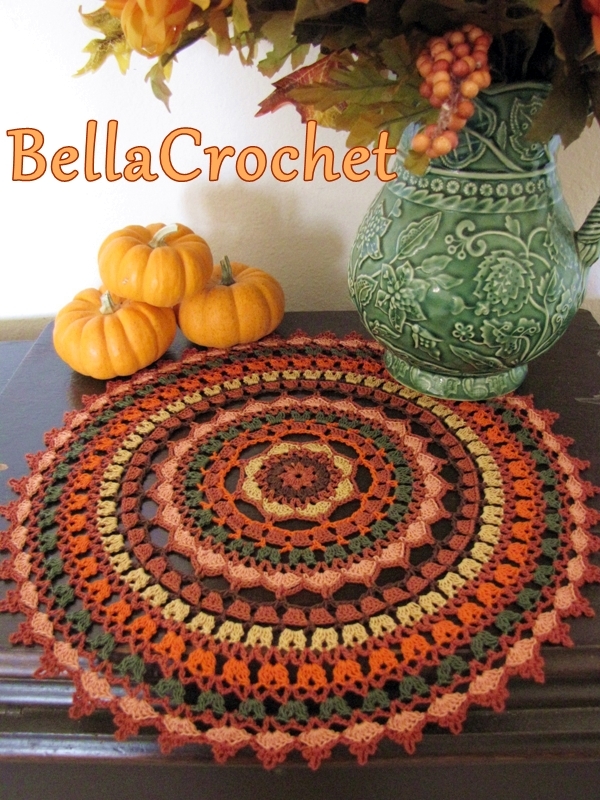 Such a beautiful autumn mandala! The colours are beautiful! Muito obrigada por compartilhar. Graças a esta postagem fiz um em tons de azul. Muito obrigada. I just wanted to let you know how much I have loved using your Autumn Spice Doily pattern and to thank you for sharing it. I up-scaled it using a DK weight cotton on a 4mm hook to make some mandala decorations and they turned our beautifully. 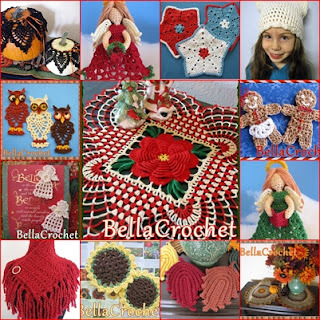 I have shared a link to your pattern/blog from my own blog, thanks again! Such awesome colors and beautiful stitches. Makes me want to go back to my thread roots (how I learned) even though it's been over fifty years since I tried "threads".